The term “artisan” has been bandied about a lot lately and applied to quite a few products that just aren’t. While it is difficult to pinpoint exactly what is an artisan food and what is not, we can probably all agree that anything coming from a mega-food producer isn’t a real artisan food item. Karen and I had several discussions about a good definition of “artisan food” when we talked about starting this blog. We liked something like this: a food product made in small batches, often made by hand or with traditional methods, that may command a premium price because of its exceptional taste and quality. The three generations of family bakers at the Glendale, California Kermanig Bakery are clearly artisans. Using old world recipes, they have been making bread by hand for more than half a century and their Mediterranean Foccacia breads are outrageously good. Really. We recently sampled three flavors: tomato and mushroom, spinach and cheese, and rustic olive. Our favorite? All three, with maybe the slightest leaning toward rustic olive! The bread is light and tender, but crisps up delicately when warmed. 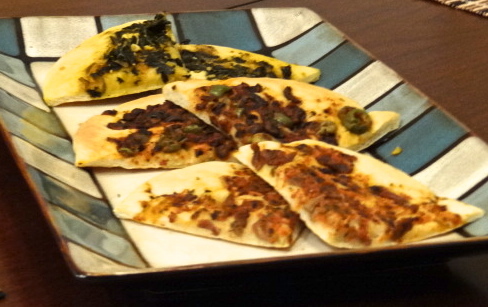 The toppings are superbly seasoned and generous, and although they are common pizza garnishes, the texture of the bread distinguishes it from traditional pizza. It would make a great appetizer, a tasty soup or salad partner, or even a light entrée. The foccacia is super-quick to prepare. We brushed it with olive oil, then warmed it for 5 or 6 minutes in the oven. It was perfect! The breads can be refrigerated, or frozen for longer storage. We found these delicious breads at a Costco event, and as soon as we walked out of Costco, I wished that we had bought enough to fill our freezer. 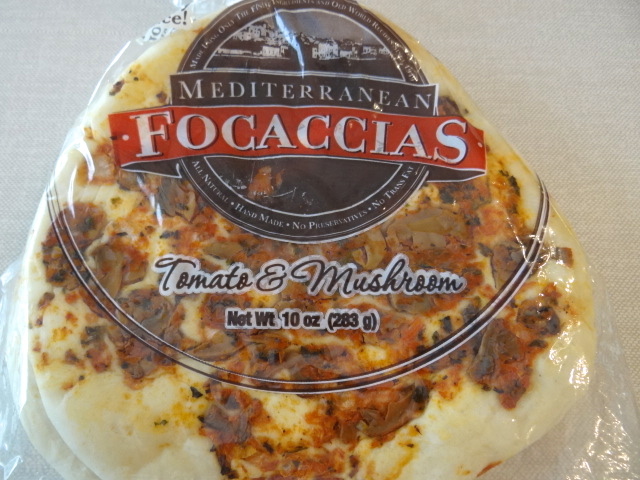 Or maybe had bought a new freezer dedicated solely to Kermanig’s Mediterranean Foccacia! Fortunately, we can order from Kermanig’s website until they come back to town. This is a treat not to be missed!